I am quite ambivalent about the Filipino nation and its people. It gives me a sense of pride for its cultural richness, the people’s generosity, humility, ingenuity and limitless potential. At the same time, this pride is wrapped up in a shroud of shame about its poverty, corruption, elitism, selfishness and violence. I have a special stake in all this because I am Filipino, whether I like it or not. It’s not an association that I can resign from like you would a club. I wish I had made this realisation when I was much younger. Almost twenty years ago, my parents brother and I moved to Carins in Queensland, Australia. My mother decided that our relatively comfortable, Filipino-middle-class lifestyle was not good enough and wanted something better. I didn’t know it at the time, but this was a huge shock to my system. Where previously I was part of (arguably) the most prestigious private primary school of Negros Oriental Province, I suddenly found myself in a lowly Queensland government school. I used to look down on public school kids and now, I have become one myself. The bike path to White Rock State School used to pass by Trinity Anglican School, a more prestigious local private school. On more than one occasion, I thought to myself, “I belong there, not with these peasants”. Where we previously had maids to do the laundry, wash the dishes and other housework, I found myself being forced to do chores because we could no longer afford them. My parents were professional people of note in Dumaguete City. My mother was the head the diagnostic laboratory in Negros Oriental Provincial Hospital, my father an auditor at GSIS. Yet, overnight, they’ve become common workers, stripped of all influence. I didn’t know what to make of it then, but this was a huge hit to a developing mind’s ego. My reaction to it was to avoid and deflect any questions about my heritage and origins. Yes, I wanted to fit in, but I think it was also a way for me to avoid confronting what I thought to be a massive fall from grace. Anyway, the reason why I mention all this is to show that even as a pre-teen child, I already had these elitist tendencies. How much more entrenched would it be with grownups? Speeding fast to the twilight of my 20’s, I have since gained greater wisdom and shed this class based bigotry. Indeed, I am a proud product of the public (albeit Australian) education system, from primary school, to high school and university. Yet, in my most recent observations of the Philippines, this social divide is ever present and culturally ingrained. There is still a very distinct and observable subservient class of citizen that is paid so low that they have no hope or face extreme difficulty in improving themselves. It is simply seen as normal, with not much thought about a more equitable social structure. Construction workers, taxi drivers, baggage porters – their services are so abundant that their labour isn’t valued very much at all. Even so, they spend well over half the day, toiling, just in order to make ends meet. There is no prospect of being able to afford better education for themselves nor their children; no time to cultivate intellectual interests; no possibility of saving for property or other investments. Suggestions of pay increases are dismissed as unwarranted charity and over-generosity towards the undeserving individual. It is almost as if these people have been dis empowered by design with the express intention of maintaining very low service rates. It isn’t technically slavery, but I’d say its fairly close to it. For all its wrongs, The Philippines is a beautiful place. On this trip, I had the privilege of experiencing the Danasan Eco Adventure Park and Oslob Whale Shark Watching. A Danasan highlight is a 3 step waterfall. The first gentle drop. The second waterfall drop sports a small natural pool ripe for bathing. Danasan itself is a private family property that’s been converted into an adventure theme park, much in the same way as Jamberoo. What is most striking is the sheer number of natural features that is within the property itself. The place seemed more characteristic of a national park or a public forest. It is so gratifying that this particular set of property owners had recognised the true value of what they have and worked to preserve and share its beauty. Appeasing my socialist tendencies is the fact that the common population are benefiting as well, with most staff being drawn locally. Awe inspiring. Staring into the gaping maw of a giant. My cousins and I pose next to a “Jawsing” shark, only meters away. Oslob Whale Shark Watching is a similarly encouraging tale. According to local accounts, the place was once a working fishing area. Then, only a few years back, some whale sharks started approaching the fishermen; attracted by the fish that was being caught. The fishermen quickly realised that they could make a much better living showing off the whale sharks instead of simply fishing. This could easily have gone out of control, but the government got involved and helped in developing the site. Now (in my opinion), there is a successful, environmentally responsible, locally run tourist attraction with something truly unique to offer the world. I am quite the environmentalist leftie these days, so I would have been quite concerned about the exploitation of such majestic creatures. But I don’t see this as being a big problem at Oslob. Before we were allowed in the water, we were warned of the severe penalties of deliberately touching the animals (a huge fine or a few months in goal or both). And they were very ready to bring the law down on you. I saw at least two uniformed police officers patrolling the site, ready to dish out green justice. Beyond the touristy activities, I also had the chance to make some sort of a contribution to the people themselves. My cousins from the US had recently established a charity called The Little Light, along with some of their friends. An outreach activity had been organised in the remote hills of Negros Oriental. The charity would give out small bags of supplies and replace broken thongs/slippers with new ones. Naturally, I was conscripted to help.. but I didn’t mind so much. Thank you placards by grateful villagers. Group shot with the locals. This experience gave me mixed feelings. Prior to our arrival, a small crowd had gathered in the designated meeting place to wait for us. In some respects, this is a familiar situation for me. Its comparable to students waiting in a classroom before I walk in. The only difference is this classroom is now an outdoor clearing, set among coconut trees and bamboo shacks with coconut leaf roofs. Instead of university students, the people were rural villagers covering all age ranges, from the elderly, right down to young kids and babies. And they’ve prepared some placards thanking us for coming. It was truly touching. There were two stages of handouts. 1) Red plastic bags with various supplies of rice and canned goods. 2) Thongs (or slippers or flipflops) to be given to those who’s footware have been damaged beyond a decent level of usability. The first stage ran smoothly as the recipients had been pre-designated by giving them ticket numbers. They would come up to the distribution table once their number was called up. Some disorder ensued when we started distributing the new footware. There were no pre-designated recipients. An announcement was made that those with badly damaged footware should hand them in for new ones. Where previously the crowd had been orderly, a slow rush began for the table. Despite repeated instructions to step back and line up, the whole occasion turned into a gentle frenzy. I was dismayed to find out that some have resorted to destroying perfectly usable footware in order to get new ones. I don’t blame them. People are animals imbued with instincts to survive. While this was hardly a life or death situation, these instincts kicked in for some people with the goal of gaining maximum advantage of the situation. Their tenacity improved their individual lot, but they’ve left someone else no better off than they were before and reduced the total benefit gained by their local community. This, I think, is the core cultural cancer at the heart of Filipino attitudes. This kind of short sighted selfishness is observable across all levels of society; from the very poor right up to those with power and influence. Translated, the thank you placards read: “Thank you for your help. May abundant blessings also flow your way.” While I wholeheartedly appreciate the gesture of gratitude, I think these statements also betrays an attitude or feeling of helplessness. Ultimately, I think handout sessions like these are largely ineffective. Once the bandwagon leaves and the extra supplies run out, the people are back to where they were before. If you’re serious about development, you have to help invest in programs and infrastructure that empower the individual to help themselves. In Australia, at least, these structures exist. For all the talk about the failing education system, I think we have it pretty good, at least when compared to The Philippines. Public libraries are abundant and accessible. Public schools have problems, but they are still capable of producing high achieving university students. HECS ensures that higher education is accessible to everyone that has the academic ability and not just those with rich parents. It takes a massive amount of resources to establish and maintain these structures, but the cost of eroding them or not having them at all is crystalised when I look at The Philippines. I will end by saying that I am incredibly proud of my family – both in general terms and their efforts in improving the lot of the less fortunate and those that suffer (see The Little Light, EPCALM ). One good thing I can take away from my christian upbringing is this constant concern for others with no thought of reward. Although I have since rejected the myth of a supreme being, I still firmly believe that every individual has value by virtue of their experiences, insights, intellect, humour, creativity, uniqueness, potential…. all the attributes that an atheist like myself would consider to be one’s soul. 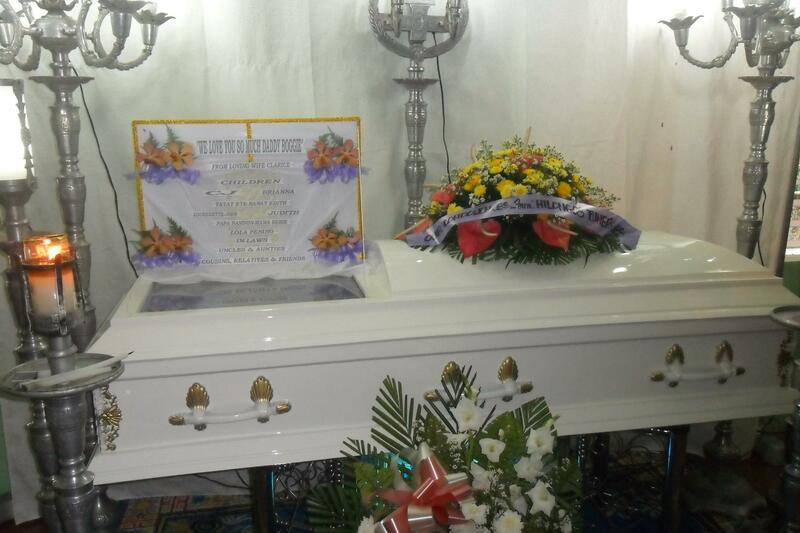 I dedicate this post to Resty Isagani Flores Lor, loving husband of my cousin, Mary Clarice Villas Miraflor. You are so much more than the violence that took you. May we find justice. This entry was posted in Contemplations and tagged Charity, Culture, Economics, Heritage, Nature, Philippines, Whale Sharks. Bookmark the permalink. Bravo. I really enjoyed reading this piece. Well written, poignant and honest. Your plight is not too dissimilar to mine and I’d imagine many others from ‘ethnic countries’ who have migrated to the developed world. The main problem I had was they were depriving someone else of some usable footware. There wasn’t enough to go around.